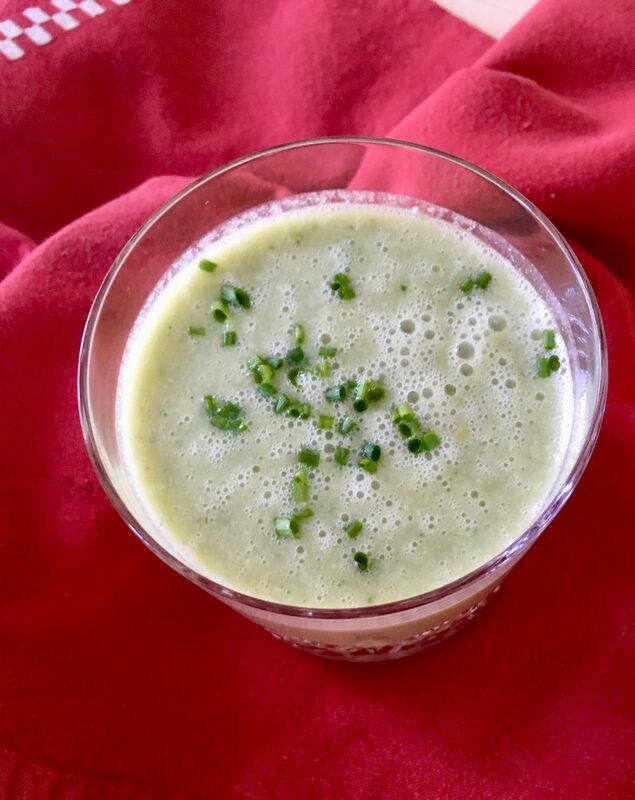 In last year’s post for traditional gazpacho, I promised you recipes for white and green ones too. Following hot on the heels of yesterday’s recipe for green Gazpacho, here’s my recipe for the white version. It’s deliciously refreshing and aside from being a great starter, it also makes a wonderful canape – so beloved of the French. The combination of cucumber, grapes and sherry vinegar is perfectly balanced while the alliums add sharpness, but mellow if you refrigerate the gazpacho overnight and serve it the next day (which I recommend). This is another perfect summer soup. And it’s so easy to make. 1. Place the bread cubes in a bowl and pour 120 ml (1/2 cup) water on top to soften them. 2. Place the toasted almonds and roasted garlic in a blender and purée until finely ground. Add the onions, cucumber, grapes, oil, vinegar and softened bread to the blender along with the remaining water. 3. Purée until smooth. Taste and season as needed. If necessary, add more filtered water (or yoghurt, see below) to the soup to achieve desired consistency. 4. Serve chilled in bowls or glasses garnished with chives and a swirl of fruity extra-virgin olive oil. 1. As mentioned above, this soup benefits from a night in the fridge to allow the flavours to deepen. 2. if you prefer a smoother, silkier textured soup, just sieve it and then froth with a stick blender. 3. You can make some substitutions but remember the soup needs to remain a pale green colour! 4. Instead of thinning the soup with filtered water, you can use yoghurt. For a vegan version, use almond rather than coconut yoghurt. This looks amazing!! I’ll try it this weekend. Thanks!